Box jumps are a great way to shed fat due to their high intensity and cardio component, but they’re difficult! I wanted to try box jumps, but I didn’t want to fork out all that dough for a jump box that might be too high. My Reebok Step was too low so I bought a pair of additional risers; now I have a box that’s perfect for me. 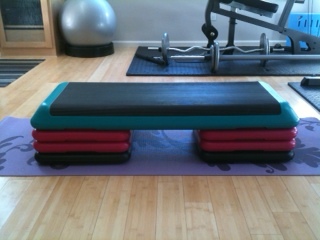 I can also add more risers as I get better at this exercise. I finally have a better use for that 90’s Reebok Step!